Following the approval of the Vakkom Project ‘Empowerment of unemployed local women of Vakkom Panchayath, Kerala State, India through aquaculture intervention’ and with support of Rabo Share4More Foundation; our Kerala partners, Organic Life; the President, S.Venuji, Vakkom Gramapanchayat; the State Government of Kerala through the Hon Minister for Fisheries and Traditional Industries, Smt. J. Mercykutty Amma and, above all, the people of Vakkom Gramapanchayat. 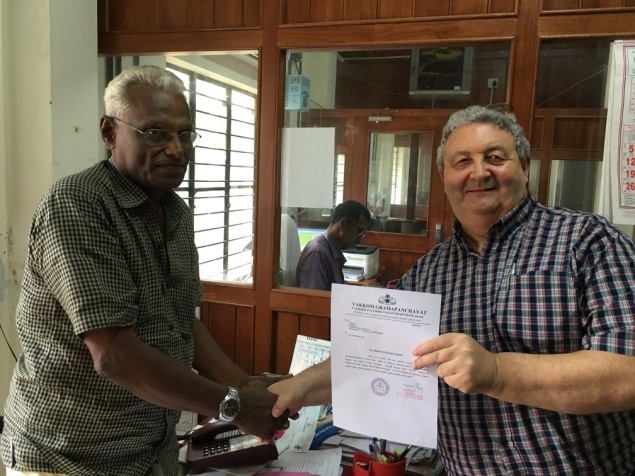 It is important to say that this would not have happened without the introductions and massive efforts by Dr. Dinesh Kaippilly and the time and promotional skills of Dr. Janine Pierce, who also got some members of her family engaged to assist. Vakkom is a small coastal village located at Thiruvananthapuram District, the capital of Kerala. Three sides of the village are surrounded by the backwaters of Anchuthengu which is connected to Arabian Sea through the estuary. The lake is being inundated daily by tidal waters and gets a high rate of water exchange from the sea. The village has a great tradition of Art and culture. Vakkom has a population of around 17640 people among which 7996 are males and 9644 females with an effective literacy rate of 95% for males and 83% for females. The population density in the village is 3150 per sq.km. Coconut has been the major crop in the village. Vakkom was popular for the production of high quality coir since 18th century and this industry was the major source of livelihood of the people. Hundreds of small ponds were constructed adjacent to the backwater for the purpose of soaking (retting) the coconut husk. Majority of the workers related to coir industry were women. In recent years, the coir industry has lost its way due to the unavailability of the raw materials, hike in the production cost and reduced market demand as people turned to cheaper plastic alternatives. This crisis made many people jobless and their families are in distress because of reduced income levels. Being far away from the urban area, Vakkom does not attract other new industries. Today the village economy is in penury and can be revamped only through serious interventions. The project aims at achieving a sustainable livelihood for the economically women community in Vakkom through aquaculture. Empower women from social and economically challenged community by promoting, educating and facilitating aquaculture business practices for generation of sustainable income and food for nutrition and trade. Create cage aquaculture of various brackish water fishes by utilizing the natural resources and developing sustainable practices. Improve the livelihood of the participants and the area by creating protein availability, employment opportunity and sustainable trade. Build a long term solution through sustainable aquaculture activities to create understanding about nutrition of human/aquatic species; operating in a business environment relating to marketing aquatic species for both domestic and export sales and empowering those who engage. The project was a dream when we first engaged with Organic Life’s, Geeji Madathil Tharanath and Renjith Rengaraju, last September when they ventured to Chennai for our meeting. From there we were able to get to Vakkom late in November and meet with the people. We were then able to get the interest of AwF Board member, Gorjan Nikolik, who introduced us to the Rabo Share4More Foundation. Having secured this support for training development it was necessary to re-visit and create some more detailed plans. A visit was planned and along that journey we were able to meet a number of important State Government leaders including the Minister. 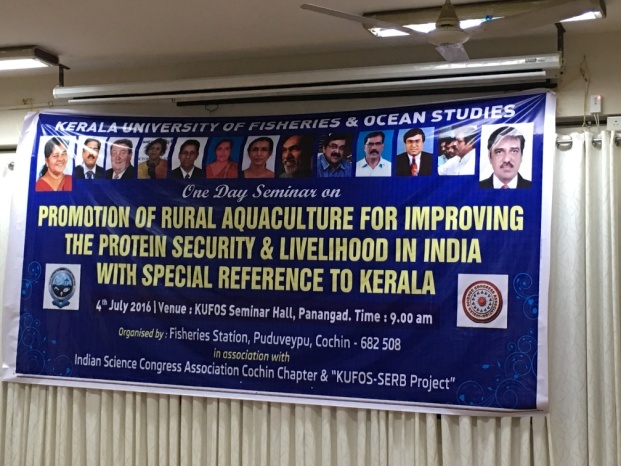 It was very pleasing that the Minister mentioned this in her inauguration speech (click to hear speech) at the one day seminar at Kerala University of Fisheries & Ocean Studies (KUFOS). The event headed by KUFOS new Vice Chancellor, Dr. A. Ramachandran, was an excellent ending to the visit. Dr. K.K. Vijayan, Director of Central Institute of Brackish water Aquaculture (CIBA) gave the keynote particularly highlighting that we all need to ensure that we take every opportunity to work collaboratively and to ensure that the potential of aquaculture was not wasted. Dr. Madhumita Mukherjee, Additional Director of Fisheries, West Bengal and Mr. P. Sahadevan, Executive Director, FIRMA Govt. of Kerala gave important updates on activities and the challenges that face the state. Other important presenters included Dr. Daisy C Kappen, Director of Extension & Associate Professor KUFOS; Dr. Devika Pillai, Associate Professor KUFOS and Dr Zynudheen A.A, Principal Scientist at ICAR-CIFT along with an interesting discussion on Nanotechnology led by Mr. Shiva Balivada, Co-Founder of NanoLand Global UK. Prior to the seminar we had made a visit to Kannur where we were able to meet Mr. T. Purushothaman, President, Kerala Aqua Farmers Federation and Shri.Mathachan K.J, President, All Kerala Freshwater Cultured Pearl Oysters Farming Association and it was good to see them at the seminar making passionate speeches about the importance of their organizations’ activities. Overall it was an extremely interesting and rewarding visit where we established some excellent foundations for long-term activities to assist the various communities in Kerala.